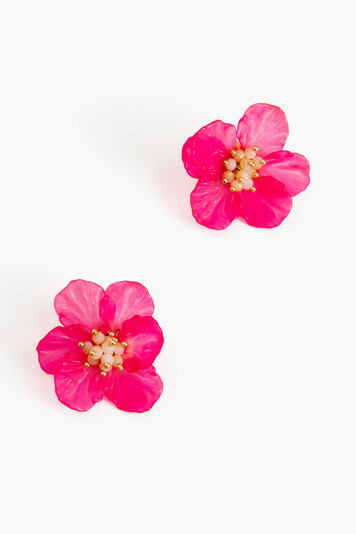 This feminine and delicate earring will add a twist to any outfit. Stay on trend this Spring with pops of bright color! These earrings are super comfortable and lightweight so I love wearing them. I also received so many compliments everytime I work them, I got them in another color! These earrings are wonderful! They are a show stopper. Prefect size with a pop of color. Can go with any outfit - casual or dressy. I bought them in another color too! 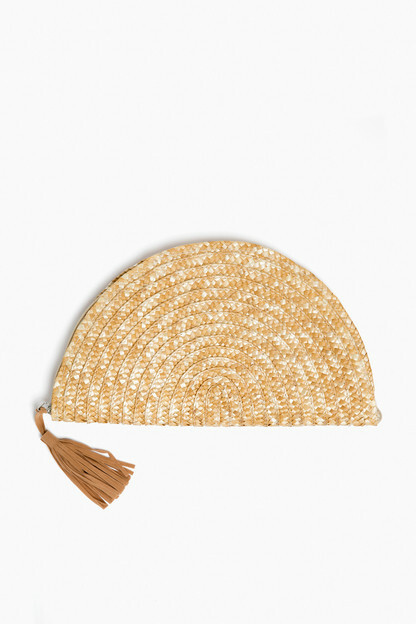 Perfect for summer and to transition into the fall. These earrings are a great addition to anyone's collection. While on the mid-larger side, they're super lightweight, and I find I can easily create both casual and dressy outfits with them. I would highly recommend, especially at a sale price point! Adorable pop of color! 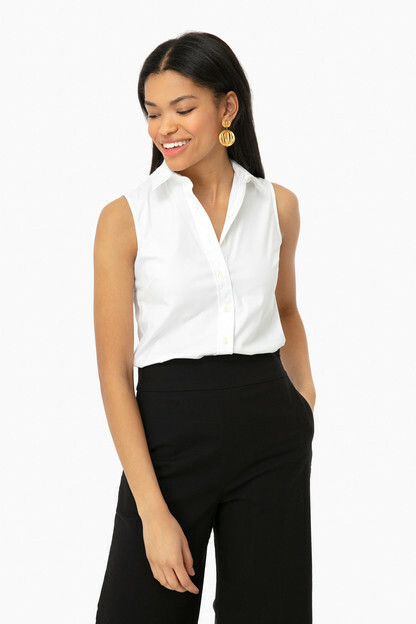 I purchased to go with a solid black dress for outdoor wedding. 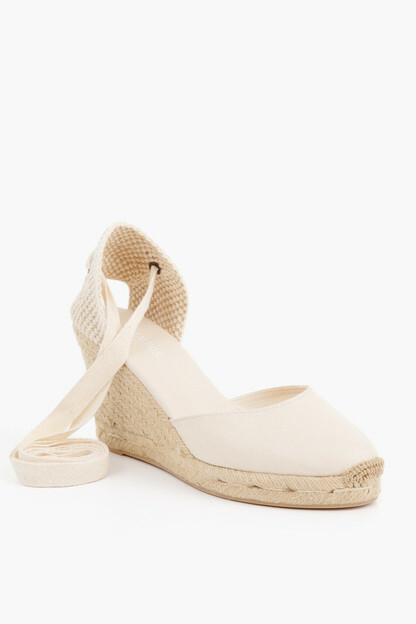 Got tons of compliments and best part they are super light weight!! Sweet pop of color and surprisingly lightweight. Cant beat the price! Lightweight and are the perfect pop up of color - can also dress up or down! Wore these to a spring wedding and loved every minute of it!! Not too heavy, perfect size to be noticeable but not over the top. These earrings are perfection! The color is absolutely beautiful. A great addition to any outfit. These earrings are stunning and super lightweight! I think the size is perfect and I barely feel them in my ears. They go with everything too which is a plus!! These earrings, while big, are extremely lightweight! Wore with an all white ensemble, received so many compliments. Going to get them in blue! The perfect spring and summer earring! These are light enough to wear all day long and add a fun touch to any outfit. Would absolutely recommend to anyone considering purchasing these!! YOU NEED THESE FOR EASTER! 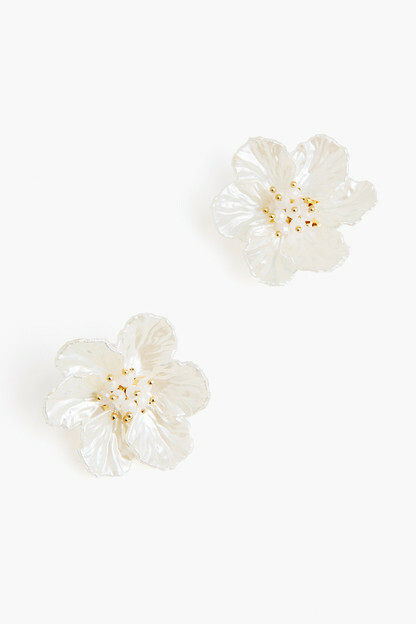 These are so elegant and a perfect pair of earrings to wear for Easter or to a wedding, baptism, etc. You can't go wrong! I love these earrings .. the detail is so beautiful and will go with so many outfits ! So cute, but they broke on my second wear! Love the look, they're big but light and add so much gorgeous statement to a cute outfit! I was so sad, though, when after gently wearing mine twice the post separated from the flower part of the earring. I absolutely adore these earrings! I get compliments every time I wear them. They go with so many different outfits and are such a cute accessory to add some detail to complete your look. Definitely an oversized look- great quality and price! Great statement earring! The petals can be moved slightly for the perfect look! I ordered the white earrings and I love that they aren't heavy. My biggest pet peeve with bigger earrings is the weight, but these are no problem! These are my absolute favorite! They go with everything! I wanted To love these (I had Tried the pink too) but they were just too big. Part of me still really liked them but another part thought they were just oversized. Perhaps they didn’t hang on my ears as they are supposed to. They are beautiful earrings though! I adore these earrings! They are super light weight. I love the classic, yet fun vibe! Thanks Tuckernuck! My New Weekend Go To Earrings! I love these earrings! They are very light weight and can dress up every outfit. Such a great price for great quality. These earrings are even prettier in person—the photos don’t do them justice. However, because of their size and weight distribution they don’t lay properly on your ear and droop down. They would be much better in a clip on style. I love them so much I am actually going to convert the backings. I wore these to a garden club luncheon, and was stopped by every person in the room to tell me how much they loved them. They fit beautifully and looked amazing! I wanted to love these earrings SO much but they were just a tad too large for me and didn’t lay well on my ear. Sadly, I ended up returning because of this. Otherwise the color and quality seemed great! Give them a try and see if they work for you!! These earrings are amazing. I was stopped in the streets several times while wearing them! They look so luxe and are surprisingly light weight. I wore them all day into the evening, and my ears didn't bother me at all. Great purchase for yourself or as a gift! I can't wait to wear these for my wedding. They are just what I was looking for! The perfect lightweight and elegant statement earrings. Beautifully made, elegant earrings. The white and gold combination adds a touch of class and brightness to any outfit, and can easily transition from day to night. Very happy with this purchase. Love these! 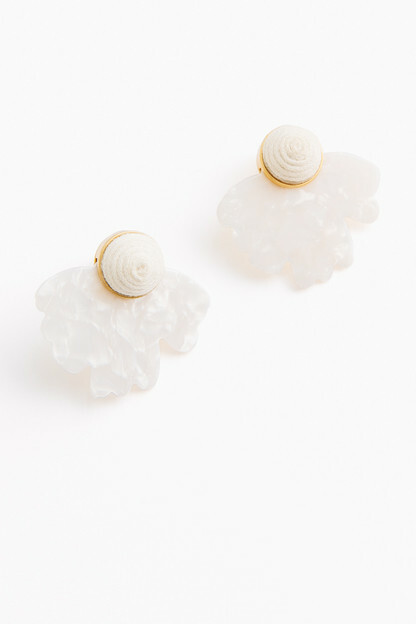 These earrings are super cute and fairly light weight. They are bigger than they appear but that was a bonus as far as I am concerned. I have received tons of compliments on them every time I wear them. These blue flower earrings are lovely. These earrings will be perfect with a dress or even a casual outfit. They are large, but not heavy. These are so light and easy to wear. I got the white and have worn them several times, highly recommend! These earrings are a wonderful weight and they are beautiful! Every time I wear them I get lots of compliments. Such a fun statement earring!